Apples also have a certain significance in the littleloaf family; my Dad grew up on an apple farm, and my Mum is allergic to them. Legend has it that when my dad first divulged this fearsome fact about his new girlfriend to my apple-loving granny, she declared straight away that this woman would be the one he married. Because of this allergy, we didn’t eat an inordinate amount of apples growing up, but were absolutely instilled with the importance of eating British grown varieties when we did. Despite the millions of pounds worth of apples we eat in Britain every day, only a small percentage are actually grown on these Isles. From early-falling Discovery to beautiful British Braeburns, Cox’s Orange Pippins to russet-skinned Egremonts, Britain produces some incredible specimens of this fruit. Sadly they can often be overlooked in supermarket aisles where small print on excess packaging makes it hard for customers to distinguish native varieties from their overseas competitors. We’re currently enjoying the best of the late season crop, and this Bonfire Night just gone people around the country will have indulged in a sticky toffee apple, coated in crunchy sugar and speared on a stick. I have to admit I’ve never been a massive fan; the caramel covering often seems to be an excuse to use up less than perfect apples, and there’s nothing worse than biting through a crunchy crust to a powdery apple beneath. Parents may think they’re a good way of getting kids to eat their five-a-day, but I can clearly remember biting my way around the sugary shell before discarding the inner apple and heading on to the next sweet treat . . . The recipe below makes no such healthy pretensions. It’s a pure, unadulterated hit of sugar; dense, fudgey, almost brownie-like in texture, bound with cream then cloaked in a sugar shell or chocolate layer. It doesn’t even contain any apple. Like a cupcake, the cake pop is a confection designed as much to feed your eyes as your stomach. Available in infinite flavour and colour combinations, I find this flirty food has style over the substance of a beautifully baked brownie, cake or cookie, but it’s fun and still tastes pretty good. Sometimes all you want is a sweet, sugary hit, and for those times, this is the perfect recipe. It may not be the best thing for you, but it’s guaranteed to put a smile on your face. And if you’re feeling guilty, you can always eat an apple afterwards. Dense & fudgey – the super-sweet cake pop is not for the faint-hearted! Did you celebrate Bonfire Night with any special foods this year? Do you like to eat local produce? And what do you think of cake pops? Preheat the oven to 180 degrees C. Grease and line a 20cm round cake tin. Put the dates in a heatproof bowl, cover with the boiling water and leave to stand for 20mins. Sift together the flour and bicarbonate of soda. Cream the butter, sugar and vanilla extract for around five minutes until light and fluffy. Beat in the egg, a little at a time, adding a spoon or two of the flour mix if necessary to stop the mixture curdling. Beat until fully incorporated. Mash the dates until smooth with a fork. Fold the milk and dates into the batter then pour into your prepared tin. Bake for 20-25 mins, or until a skewer comes out clean. Remove from the oven and, once cooled slightly, remove from the tin and leave to cool fully on a cooling rack. The queen of cake pops is the amazing American Angie Dudley, otherwise known as Bakerella. For a step-by-step guide to making these cute confections (and with much more expertise than I currently have) watch this video. Otherwise follow these simple steps below. Crumble your cake into a big bowl. The next step is to bind it together to make your balls. Most recipes call for a quantity of cream cheese frosting or buttercream, but I found both a little too sweet (before you call me up on this, we’re talking relative scales here; the cake pops I made were still seriously sweet, but incorporating a sugary frosting takes them to a whole new level). Instead I used thick double cream – it makes the pops smooth, rich and creamy without being too cloying. Add a little at a time until the cake mixture forms easily into balls. You won’t need a lot if using the cake recipe above – it’s already pretty fudgey. Take teaspoons of the mixture and roll into balls. If you’re making apples, try to make them a little fatter in the middle and flat at the top and bottom. Set your balls on a plate and pop in the freezer for fifteen minutes, then remove to the fridge to continue to chill. Melt your chocolate or candy melts and allow to cool slightly. Dip a skewer in the liquid, then into a ball of cake mixture. Dunk the ball back into the liquid and roll until completely coated, letting the excess drip off. Stick the skewer in a piece of styrofoam or just rest in a tall glass – as long as the ball isn’t touching any surface, you can improvise. Once cooled and hardened, poke a small hole in the top of your ‘apple’. Secure a leaf to the edge with a little edible glue, then poke a stalk into the hole. 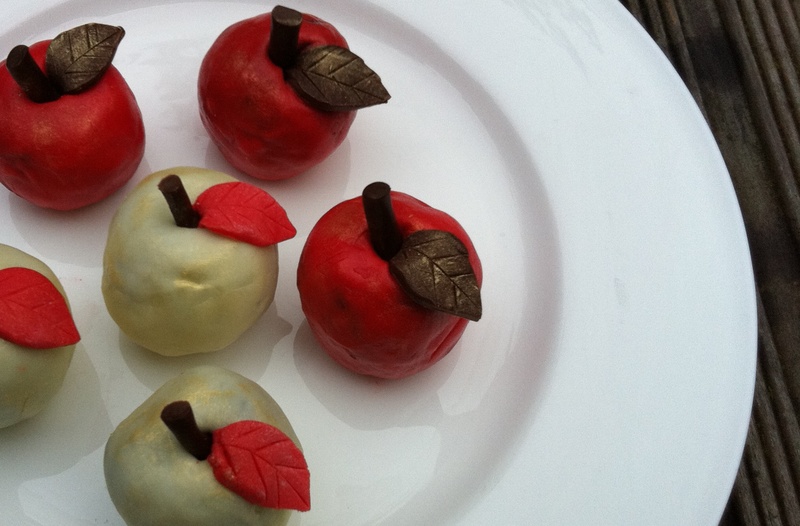 Dust your apples with a little gold dust (my current obsession), then serve. SO clever. These look adorable- how many bites to get through one?! That’s a really good idea! They are so cute (and yummy too, I bet!). These are so adorable and they sound delicious! These look so decadent and good! And I really enjoyed your story about your dad growing up on an apple farm. Thanks! SO artistic and they look delicious too…..loved reading about your dad and the apple farm…..I ONLY buy British apples, I refuse to by apples from overseas when we have such amazing apples here! oh these are so cute, I love them! They are VERY cute! and what an interesting story about your parents too-I must admit I haven’t come across anyone who is allergic to apples before! Lovely. I made these for the first time this weekend too. Mine are double chocolate. Your’s are much much prettier! 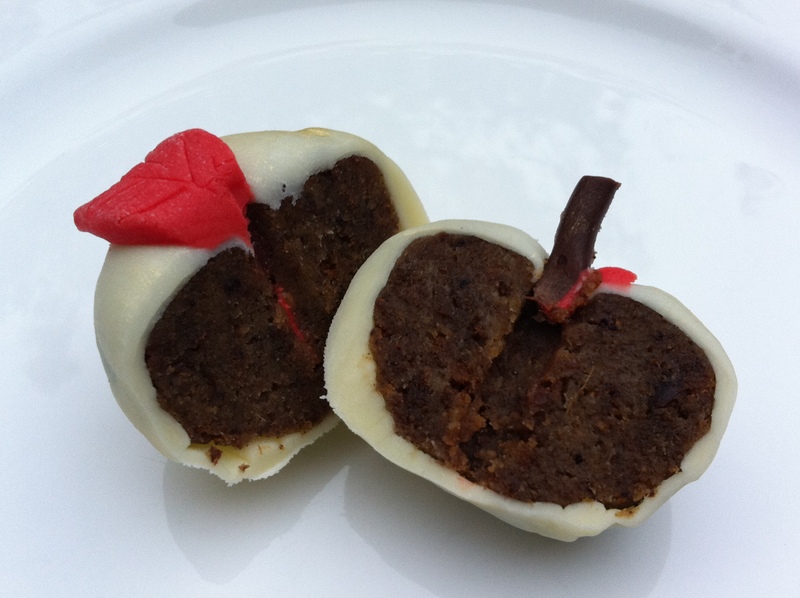 I made little apple cake pops for work once and they went down a treat although I personally find them a bit too sweet. They are ridiculously cute though. Crump Eats – my cake pops were slight whoppers so I reckon two big bites, but you could make them smaller and more dainty if you wanted! Erin – glad you enjoyed the story…people can’t quite believe my Mum can’t eat apples, but there you go! Karen – 100% with you, British apples are delicious and should be celebrated. Lorraine – I think it was fate that she’d marry the son of an apple farmer! Urvashi – double chocolate sounds pretty good to me! Great story…your grandmother was a wise woman. And I totally agree, eat local!!! So gorgeous. Bonfire night is also my birthday each year, so we celebrated with apple tart and banoffee pie. It seems the toffee apple spirit was there after all! so cute you just wanna eat them up! These are gorgeous! Love the flavours in the cake. How cute, they look lovely. 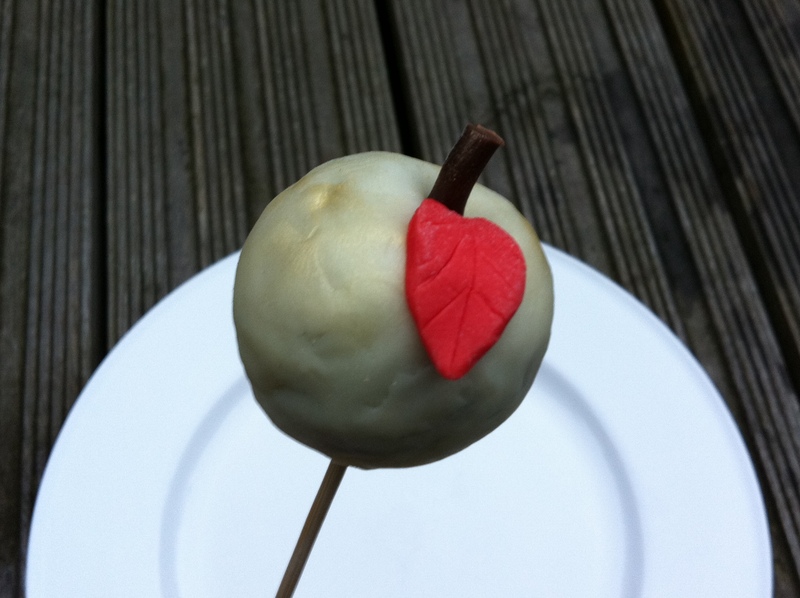 These look so cute – I am planning to have a go at cake pops! Tori – Happy Birthday! Banoffee pie and apple tart sounds like perfect celebration food, good choice. Jereme’s Kitchen – cute is definitely the word! Working London Mummy – the dates in the cake make it really lovely and moist – like balled up sticky toffee pudding! The Caked Crusader – do have a go, there are so many variations and if you like decorating they’re even more fun than cupcakes! These are just too pretty for words – some of the best cake pops I’ve ever seen as far as the cake, appearance and flavors! Like I always say – you have some heavy duty..phenomenal .taste and skills! Your posts always make me want to cry. (In a good way!) I’m the kind of person who smushes pretty baked things. I love how dainty and adorable these are. As usual, awesome post. 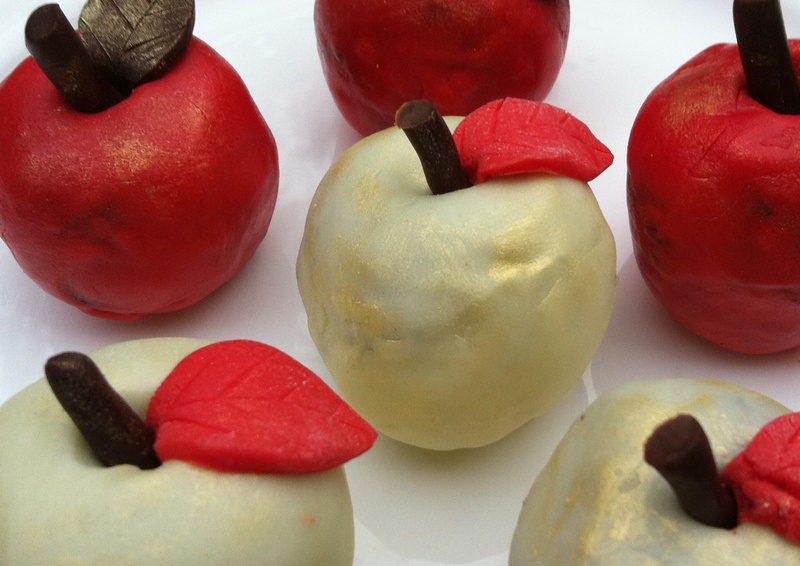 Awww your toffee apple cake pops are so adorable!!!!! I have to be honest and say I’ve never had a cake pop. They are so cute, but I’ve never been tempted to try one. Christy – haha, thank you. Jennifer – they’re very cute to look at but, as I’ve commented above, extremely sweet. Definitely not for the faint-hearted! I have never tried cake pops, but these are the cutest things ever! I would love to have a go at making these. These look amazing! I’m really loving cake pops at the moment. Anna – I’d never made them before either…they’re so simple to do though. Food For Think – haha, almost too cute to eat! 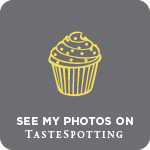 Baking Addict – I love the look of cake pops, but not sure I could eat them all the time. I’m so with you on the disappointing toffee apples – I don’t think I ever had a decent apple beneath the toffee. Not that I have had one for many years. Your little toffee apples are fun, but I can’t quite see the point of cake pops. I’ve made something very similar without the sticks and called them truffles, so I don’t think I can really justify my suspicion. Wow! They look so cute! I really love though the thought of the date cake filling, mmm!